once you get behind the eight ball there’s no coming back. While Bizzvenue generally agrees with this, there are always exceptions for people who break the rules, people who refuse to follow the status quo – such as Steve jobs. So, will you change your mind about Magnus by the end of this post? First of all, who is he? 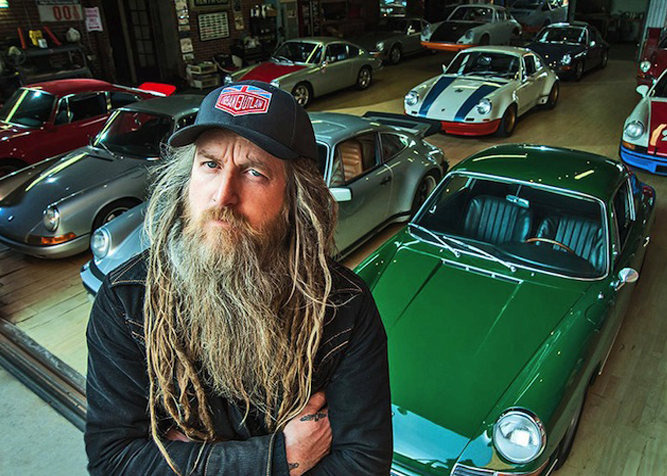 Who is Magnus Walker, and why is he on Bizzvenue? Let’s start at the end. Magnus followed his gut feeling and never let opportunities go to waste. This in turn led to great success, and today he is essentially living the good old American Dream. So how did it all start? Magnus was born in the not so promising town of Sheffield in England. He hand a dead end job and essentially no future. One thing led to another and Magnus found himself in Los Angeles. Since his arrival in LA, Magnus has quietly built a multi-million dollar business empire, which he started with just $200 and a dream. Magnus left school at 15, but in 1986, he spent the summer as a camp counsellor on America’s east coast. He decided to check out California and took the long bus ride to the west coast. He instantly fell in love and the rest is history. His first business venture was selling customised Levi’s on the Venice Beach Boardwalk. He met his wife, Karen, in 1994, and together they established a rock-fashion label, Serious Clothing, which over the years has outfitted the likes of Alice Cooper and Madonna. Once the cash started pouring in, some of the profits were used to purchase a 26,000sq ft downtown LA warehouse. Not bad! Not long after acquiring the property, it was featured in a magazine article about loft gentrification. The day after the article was published, Magnus got a phone call from a production company asking to rent property as a film location for a music video. One thing led to the next and Magnus found himself in the film location business (lucky for him, this turned into a lucrative business). He got involved with TV crime dramas and even America’s Next Top Model. Walker also happens to be a massive Porsche nut, and made a low budget half-hour documentary called Urban Outlaw about his 911 obsession and collection. Urban Outlaw instantly went viral and picked up 50,000 YouTube views on its first day online. This exposure earned Walker massive coverage all over the world, from locally in California, all the way to Japan and New Zealand. Magnus has become an Instagram superstar, but thankfully his posts are automotive related and not a bunch of ridicules selfies. Becoming a Porsche hero naturally led to more business opportunities. For instance, German toy company Schüco was quick to turn his famous ‘277’ 911 from the documentary into scale models. I didn’t grow up with a silver spoon or a Porsche in the family. Dad wasn’t a Porsche dealer or a race-car driver. We didn’t even have a sports car. But I followed my gut, worked hard, took some risks and built three things that are pretty unique and successful: the label, the building and the Porsches. Now that Magnus has a great name and reputation, new business opportunities are coming thick and fast. Rumours suggest that Walker has been approached by around a dozen television companies keen for him to make a reality show. Then, you have enthusiasts begging him to build them a customised 911. Magnus has also been approached by several non-Porsche brands keen to glean some of his maverick design expertise, including Nike, Oakley, Volvo and Bentley. Many people have watched the TED talk, read the story and quickly pointed out that Magnus was simply lucky. However, if you do a bit of research, you’ll find that most success stories come from people who have the courage and the discipline to follow their gut and do what they love. Steve Jobs, Sir Richard Branson and Elon Musk all did the same. Magnus was of course lucky, he could have found himself homeless in LA. He had no fall back. The key is point is that Magnus was lucky, because he engineered his luck. He was given various opportunities over the years and he didn’t let them go to waste. He simply figured out what to do the cards he’s dealt. I don’t get lucky, I make my own luck. Magnus, although he doesn’t wear high end suits and a $900 hair cut may just be the “real-life” Harvey Specter, not getting lucky, but rather making is own luck.